Residents help to take the bodies of the three students out of the wrecked car. 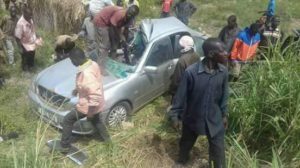 Four former students of Ndejje Senior Secondary school have died in a fatal accident at Mile 19 stage on Bombo Road. They include Vincent Male, Isaac Sewajje, Sedrick Muwanguzi and one only identified as Timothy. Male, Sewajje and Muwanguzi died on the spot while Timothy succumbed to his wounds at Bombo Military Hospital where he had been admitted following the grisly accident. Sources intimated to PML Daily that the quartet were on their way to the school to pick their UCE exam results earlier today when the car they were traveling in had a head-on collision with a Tipper lorry. Information that this website has obtained indicates that one of the students asked for a car from his mother to go and pick his results and when she declined, he turned to the uncle who gave him a car. Knowing that he lacked confidence on he road, though he possessed a driving permit, he surrendered the car to one of his friends and the quartet set off for the fateful journey. Meanwhile, one person died and several others were injured when a Fuso truck veered off the road in Mabira forest. The deceased is yet to be identified.